Stitch the most gorgeous quilts under the sun!Twenty fabulous masterworks comprised of colors, patterns, and textures that capture the essence of brilliant sunlight are yours to enjoyÂ—in stunning photographs and in future creations. 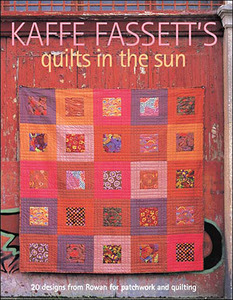 Master colorist and quilter Kaffe Fassett escorts you through a showing of each gorgeous new piece accompanied by photos of the quilts taken the sun-drenched shores of Portugal, the inspiration for the fantastic designs. Detailed instructions, diagrams and templates accompany each work ensuring that your "quilt in the sun" will be in hand before long. Twenty new creations from the master himself and acclaimed designers such as Liza Prior Lucy, Mary Mashuta and Amy Butler. Detailed step-by-step instructions. Exuberant colors and patterns. Varied palettes for selected designs. A special section of tips and techniques. 144 pages, Softcover, Color, Copyright 2007, ISBN: 978-1-56158-991-3.